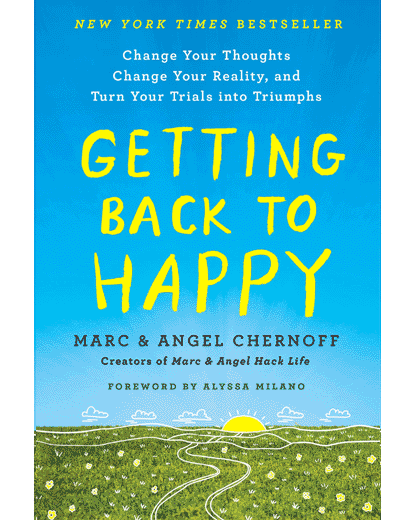 Over the past decade, via our blog, Getting Back to Happy course (and coaching), side projects, and live annual conferences, Angel and I have been blessed by the amazing stories that people around the world have shared with us. And right now, with full permission from the original sources, I want to share powerful snippets from sixteen of these stories with you. These are super short but incredibly focused accounts of life, decision-making, and the subtle regrets that sneak up on us along the way. Which story (or point) above resonates the most with you right now? Also, our next annual Think Better, Live Better conference is taking place February 10-11, 2018 in San Diego. Two discounted early bird tickets are still available today (while they last). M&A, I’ll keep it short, but I wanted to say thanks. I’ve been reading your emails and blog posts for over a year now but I’ve never left a comment. This post spoke to me—the stories hit hard, and also your commentary and suggestions about focusing on what matters and letting go of old regrets. Thanks for the kindness. Angel and I are looking forward to meeting you in San Diego. Such thought-provoking stories! These remind me of shorter versions of some of the stories from your book, and perhaps they are. Anyway, I connected most directly with the story about the grandfather placing flowers on his wife’s grave. It such a harsh reminder of our limited time with those we love, and how important it is to actually love them while we have the chance. An important reminder for all of us as we enter the holiday season. Incredible stories and thoughts on life, Marc and Angel. I’m so glad you emailed out the link to this article today. I especially loved the opening paragraph, so I copied it and printed it out. It’s going to be my new motto—a reminder to focus on what matters. Also, story #16 is how I want to live my life. Obviously I hope to live a long life, but I want to make sure I’m living a full life every day too, so I have no regrets even if it gets cut short. There was a time when I was absolutely on the wrong track, but with your blog and course’s teachings, I’m now on a much better track. I’ve been focusing more on what’s important and letting go of what isn’t. Keep going, James. You’ve been making excellent progress! They each had something to say and a had a lesson to be learned. I have read your emails for the past year. I had a very tough year—personalities at work caused me to question myself and my abilities. Every day I would come home complaining about work, and my supportive husband finally said, quit. Of course I did not have another job (we need 2 incomes–my husband is a teacher), I’m 57 and I did not know what to do. But I gained strength through your emails, and I quit my job on 09/01. I haven’t found a new job, but most importantly, I have regained a sense of myself and my relationship with friends and family. I have no regrets now—-thank you both. I have been getting your posts delivered via email for over a year and this one hit home. Especially the one about the mom downsizing. I am and have been in this situation. Being in a smaller home where the kids and i are always together is great because when they aren’t home i miss them dearly but i also appreciate the silence. The silence gives me a chance with my thoughts, and prayers. I find this reminds me to be thankful for what i have, especially on the days when my kids might drive ne nuts! I don’t know what i would do without them in my life! You are welcome, Kelly. Thanks for the kindness and for sharing a piece of your story with us. I’m far away in the UK so sadly I cannot attend your upcoming conference in San Diego, but I truly wish I could. And I’d just like to say thank you so much for sharing your wisdom on a regular basis. Through your words your souls shine and I learn life’s lessons. I am getting on. A woman in my sixtieth year, outwardly I am successful but inside I carry the open running inflamed scars from a childhood of abuse, abandonment and loss. The void has never been filled, I feel a failure to my two adult children, most days to the point of death. Your words nourish me from the inside like healing salve for the spirit and I thank you. Today’s words and examples comforted and strengthened me. The grandfather who encouraged his grandchild to waken up with gratitude every morning changed my attitude. Every day I waken up thinking I’d be better off dead. Not any more. I’ll give his way a try. May God give you peace and joy and make you see how beautiful you are and be who you were made to be!! The past will not define who yoy are anymore!! Thank you for finding the strength to share a piece of your story here. We are thinking of you. We are with you, 100%. Cheers to giving yourself another chance… and another. This post has completely taken the wind out of my sails and has nudged my thoughts in a different direction. While I have food for thought now, I feel calm and settled because I’m going in the right direction. I may not know where I’m going but I know I’m going in the right direction. As a grandmother of fourteen children, I try to attend the important affairs in their lives. Many times, my “friends” tell me to save my money; I might need it. But I tell them I am making memories that will last much longer than my money long after I am gone. My children and grandchildren will look at the pictures and remember that I was there for them, to celebrate their achievements with them. I hope to die with no regrets and satisfied with the love I gave… and received. Yours’ is a wonderful story by itself. Thank you for sharing. Yours is a wonderful story by itself. Thank you for sharing. You’re really kind to others to have tidied up this post and teaching others life lessons of happiness and thinking. I feel that I have benefited greatly and holistically as a person, reading the articles and reflecting on the decisions I have made. I am forever grateful for your dedication to this blog. Cheers! Thank you for being the inner voice we, sadly enough, do not listen to enough. #10- Being thankful every morning for life-because someone somewhere is fighting for theirs. I thank God every morning first thing when I wake up. I’ve fought the fight of many others and am a survivor. I fully understand that there are no gaurantees of another day, month, or year. I am thankful for mundane-normal days-because they are days I might not have had. I tend not to take any portion of time for granted- because there are no guarantees. Your words always provoke in me a reaction of good, to make better decisions , to question myself every now and then, we all need to maybe take a step back and look at things differently, today’s message made me think about how we fall out with people over very simple pathetic things, i certainly need to watch my approach, the lady who said she is making memories now and i thought that’s so good, often inheritances are spent quickly with no thought to the person who left it, where as if you spend it with them while you are alive, its a win win situation, i will certainly adopt that one. #7 man with wild kids on the bus, #14 grumpy customer resonate with me. You never know what is going on in someone else’s life. How they act is likely not about you. Not always easy to remember this! Thank you so much. All stories touched me in so many ways. Of lately, I have been walking around with a lot of fears and things that happened in the past. Everyday, i am thankful for life, but these stories made me realize that i may not be thankful enough. The point on the 23 yr old mum and her 7 year old son. The fact that he saw beauty where most wouldn’t has really moved me. Thank you for no. 7. I wanted to know what the annoyed passenger did. No. 1 is me. I literally said to my husband yesterday how bored and frustrated I’d felt as a stay at home mum for all these years, however I am really proud that I went to 99% of all our daughter’s primary school events. All her class mates know me and feel confident to chat to me. They have all just gone up to secondary school and to my delight, when they see me dropping my daughter off at the bus stop or fetching her, they wave and smile. At primary school they didn’t take much notice of me but now they see me as a familiar face and look really excited to see me. It makes me so happy to know I made a difference to some children in life. I want to thank you again for all your inspiration. You may not be fully aware of how much and how many you’ve helped but I hope someday you will. I’ve been able to come to terms with a lot of my demons, I’ve grown and hopefully became a little wiser and definitely a lot more content. Thanks again for the great work you are doing. Keep it up! Each story has an impact on me but especially the one with the man on the train with the unruly kids. We may judge from afar but we just don’t know the pain someone else it going through. In an instant we realize that our thoughts are so limiting to the fullness of our potential. Your articles improves lives, especially mine, thank you. Thank you for all the wonderful reminders of Life and I do get up each morning and sm blessed to be able to do what I have to do each day.Thanks again for all your articles. Happy Holidays! I lost my mother to cancer in 1989. I lost my father last year on January 4. I was the last of my siblings who moved out of the house as I got married. A couple of months after that his BP went very high. That was the beginning. Some years later he suffered a paralytic stroke when I was visiting him over a weekend with my 3 year old child. My husband, me, and my son, all three, moved in with him as no one can replace family in taking care of an ailing parent. The 10 years we were all together are the most wonderful years of lives. There was so much he had to give to us. Even now, we often place ourselves in his shoes and think how he would have handled a particular difficult situation that we might be facing. Parents are the most priceless gifts we can ever have. I feel stronger knowing that he is still with us and that he is OK. This has been my desire since the birth of my son. I’ve lived so rough childhood and then I entered a marriage that only helped to push me further down and Rob me of hope….hope for love, hope for acceptance, hope for peace. then was forced to make change because I want better for my son. He has been the breath of fresh air that came in just before I decided I would take my last…breath. I’ve been reading your blogs for some reason while…taking small steps and I must say thank you because for the first time in a very long time i have a seed of hope. I’ve learned to mother myself and father myself and love myself and acceptance myself and I do believe it has lead me to be a better mom and overall person. I am all the way in barbados but I hope to take your online course in the future when I clean up my finances (something else that went downhill with marriage). Have a wonderful holiday and I pray God’s blessings over you in 2018! The story that resonated most to me was the moving to a two bedroom apartment. Kids don’t care where you are they just need their parents to be with them. I have been thinking of downsizing because of my budget and I loved that story the most…. I am going through the pangs of separation from my husband of 23 years.Today was filled with anger recollecting how he hurt me for all that I had done for him. The stories you have shared made me think again.I let go off all anger and felt touched by those moments in life you have shared.It has given me strength and hope. What a beautiful read! #4 is my favorite right now, but they all have touched my heart for various reasons. For a few years now, we have suffered through a devastating time in our family. And, as if my life/our lives haven’t been bad enough, now I must watch my son go through a shocking divorce. Throughout this tragedy, his youngest adult children do not communicate with him and, if they do so it is very brief. He has never given up on them! He loves them so much! #4 touched my heart. WHY? MY SON HAS NEVER STOPPED ASKING THEM, “HOW ARE YOU DOING?! NOT ONCE IN OVER TWO YEARS HAVE THEY ASKED THEIR FATHER, “HOW ARE YOU DOING? !” HE IS AND ALWAYS HAS BEEN A WONDERFUL MAN AND FATHER! NOT PERFECT, BUT HE GAVE HIS BEST AT ALL TIMES! LASTLY, A QUOTE I HAVE LEARNED TO LOVE: ” YESTERDAY IS THE (PAST), TOMORROW THE (FUTURE), TODAY IS A “GIFT!”, THAT IS WHY THEY CALL IT (PRESENT)!”. The story that really resonates with me right now is number 11. We used to have a good relationship when we were younger but right now, I’m trying to work things out with my sister who I haven’t seen or talked to for a long time. I’m not sure exactly what happened , but I have a feeling it is something that is very insignificant. I haven’t worked things out with her yet, but I have a feeling after I do, we will be close again. The story that most resonated was the one about the man bringing a flower to his wife. Many people take each other for granted until we lose each other. I am a 42 year old, single mother. My children are grown. I had them young, just like one of the women in the stories. I also had to have a hysterectomy at a young age, 25. I have no regrets about having them. For the past 22 years, they have been my life. However, this year I chose to follow my dreams. I sold my belongings aside from clothing and moved to China. I will be traveling the globe, working, teaching, living, enjoying and doing my best to find happiness in myself and my life, outside of being a mom. I started visiting your site about 7 or so years ago when my sister told em how wonderful it was. I am a recovering alcoholic so I look for inspiration in any way I can. I found ALOT of it here. Since I started reading your blogs I have relapsed several times. Some near death. Hospitals, treatment etc. I am now sober once again going on almost 3 years. All of these stories touched my heart. The one mentioning fear hits hard for me. I am 34 and have wanted to go to school for my Bachelors of Science in Addiction and Psychology for 7 years now. But…with my relapses in the past I kept having to put it off. Noe sober for a length of time I find myself making excuses. Money, time and I have two children so these things make it very hard. I dislike feeling inadequate and am scared of the unknown. Also have high anxiety at times. The commentary put me tears. I am a certified nursing assistant today and this is not what I consider a career nor am I able to get by on my salary. My heart lies in the psychology aspect of things! I have been there …over and over and I want to help others who fear there is no way out. Its what I am meant to do!!! No doubts…but again…there is so much fear and anxiety on going to school…money and time. Now that I am rambling I guess I just want to say that what you 2 have built here is beautiful. I thank you.